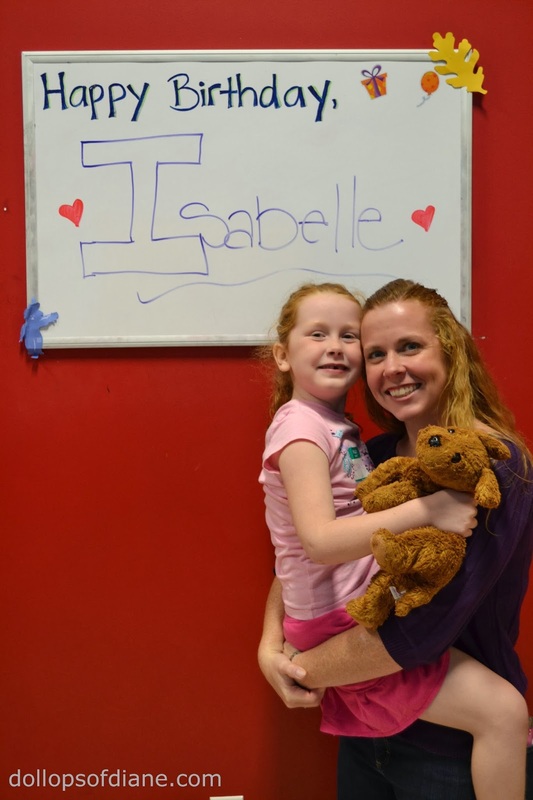 Dollops of Diane: Happy Sixth Birthday, Isabelle! Today my craft-a-holic, clean-a-holic, amazing little girl turns six years old. On Friday night, we had a special girls night out with my cousin Janet where Isabelle got to pick out her own present and have dinner out. Today we had her party at a local bouncy house place with her friends. There were 21 kids hyped up on bouncing and cupcakes. Needless to say a good time was had by all! If you need to find us, Isabelle will be at the dining room table for the rest of the day working on assorted craft projects that she got for presents. I'll be staring across the table at her wondering where my toddler went. Also, I'm starting a new tradition of asking questions on each birthday as a keepsake to see how they change from year to year. I have them written down to go in her "special box" but figured I would share here as well.